Denver Bed Bug Detection: Who Benefits From It? There is nothing worse than having unwanted pests in your home or office. However, discovering that those pesky insects are bed bugs can be your worst nightmare. 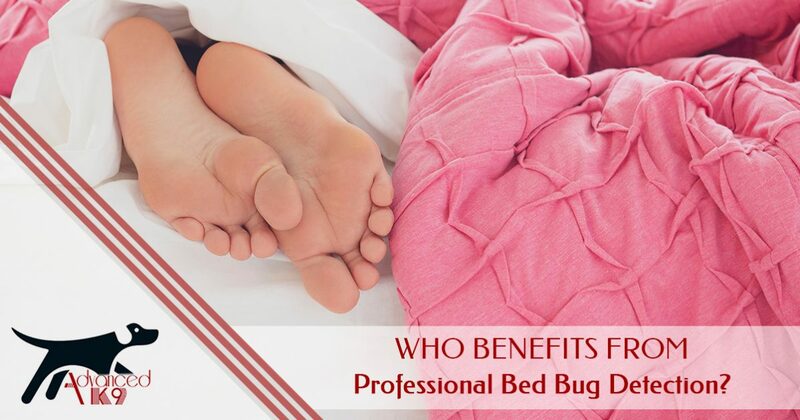 Bed bugs are hard to identify and they can be even harder to treat on your own, which is why many people turn to a professional for help. Advanced K9 Bed Bug Seekers is your Top Rated Local® bed bug detection company in Denver, and we are happy to provide you with industry-leading detection services to restore your peace of mind. We believe that virtually everyone can benefit from our services, and today, we’ll explain why. Read on to learn more, then schedule an appointment today! There is a common misconception about bed bugs that they only infest homes that are dirty or unsanitary. While it is true that they may be more difficult to detect in these types of conditions, bed bugs are indiscriminate pests, and there are many ways homes can become infested. The bugs may have caught a ride on your bag after vacation, or been introduced into your home by a guest. No matter how your infestation starts, there is only one way to ensure it is eradicated for good. Effective bed bug extermination starts with a thorough inspection of the home, and canine bed bug detection is as good as it gets. Once the bugs are gone, you can rest easy at night and you’ll be more informed on how to prevent infestations. If you own a hospital, hotel, or other type of hospitality property, your name and reputation are on the line every time a guest stays on your premises. These types of properties, as well as other commercial properties like daycare centers, movie theaters, and libraries, are susceptible to bed bug infestations because of the large number of people that come through on a daily basis. Your guests and patrons expect a clean, pest-free environment, and professional bed bug detection ensures that an untimely infestation won’t take you by surprise. Our team can detect the presence of live bed bugs accurately and efficiently, letting you remediate the problem quickly. Multi-family housing, like apartments and condominiums, are especially prone to widespread infestations because of the shared walls between units. As a landlord or property manager, you can hire a professional bed bug detection agency to come and inspect the property between tenants to rule out the presence of bed bugs. Once our bed bug dog has inspected an apartment, we will provide you with a written report that details our findings. At best, this provides property owners and tenants with peace of mind. At worst, it provides you with the information you need to pursue extermination. That’s a win-win situation! Schedule Your Denver Bed Bug Detection Appointment! Are you concerned that you have a bed bug infestation in your home? Are you a commercial property owner or manager who needs reassurance that your hotel, hospitality facility, or apartment complex is bed bug-free? If so, contact our Denver bed bug detection agency today. We will perform a thorough inspection of your property with our bed bug dog, Tracker, to determine if there is any bed bug activity present. Tracker can detect live bed bug activity with more than 90 percent accuracy, providing you with the benefit of a more accurate inspection than the human eye alone. Ready to get started? Schedule your bed bug detection appointment in Denver now!